FULL TIME; SUNWOLVES 29, WARATAHS 50 - It's all over at Prince Chichibu Memorial Stadium and it's the Waratahs who earn a bonus-point win on the road with a strong second half showing against a determined Sunwolves outfit. With the hosts not shy of throwing the ball around, the 'Tahs were able to control the game at important sections of the stanza and score points when challenged. The Waratahs eventually running out comfortable 21-point victors in Tokyo. With time ticking down, it's the Waratahs who look as though they'll have the last attacking opportunity of the game with a scrum in the middle of the park. With the 'Tahs getting the penalty, there's a fair bit of push and shove which breaks out before the referee intervenes to quell it. Foley has a stroke of luck with his conversion attempt as he sets up tightly on the left sideline. Starting it out to the right, the ball curls back perfectly before dropping onto the crossbar and deflecting into the in-goal. The 'Tahs bring up their 50 .. CONVERSION WARATAHS! (Bernard Foley). 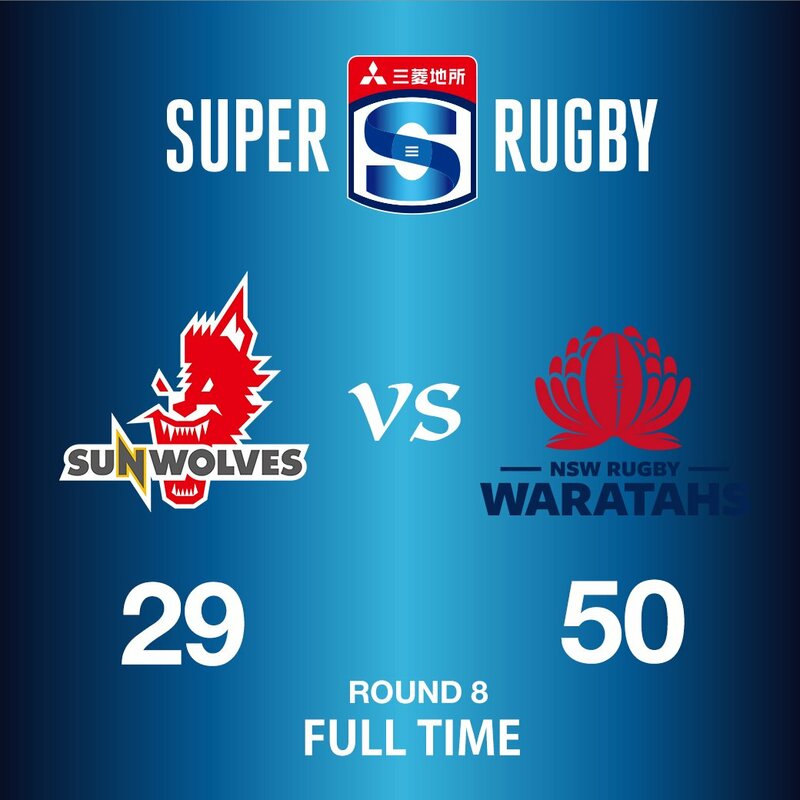 SUNWOLVES 29, WARATAHS 50. NSW with a critical response as they elect to move it to their left side with speed. With Gordon providing for Miller, it's a simple case of draw-and-pass before the final ball is presented to Naiyaravoro who proves too big and powerful to pull down from short range. TRY WARATAHS! (Taqele Naiyaravoro). 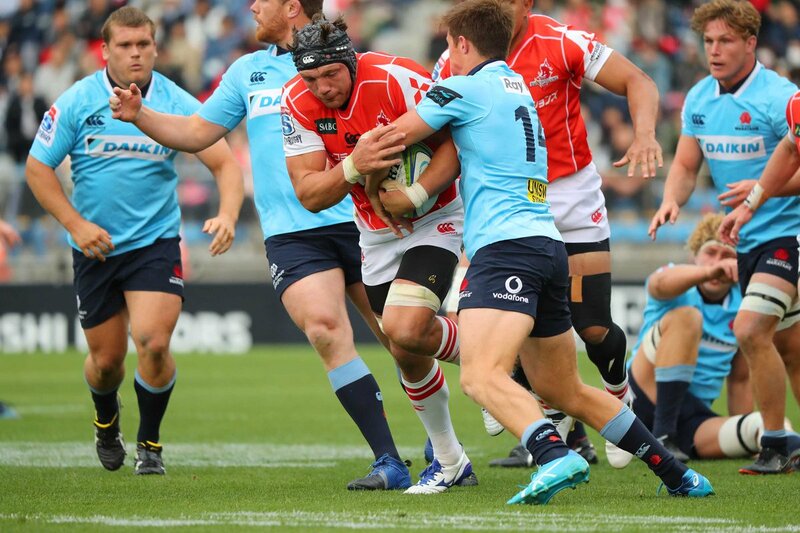 SUNWOLVES 29, WARATAHS 48. Little time is taken with the conversion as Parker easily burrows two more points home from right in front. With 11 minutes remaining, the Waratahs still lead the contest by 14 however the 'Wolves are finishing fast. They couldn't could they?? CONVERSION SUNWOLVES! (Hayden Parker). SUNWOLVES 29, WARATAHS 43. TRY SUNWOLVES! (Kazuki Himeno!). SUNWOLVES 27, WARATAHS 43. The hosts continue to heap pressure on the Waratahs defensive line as open play sees the ball five metres short. With Hooper wanting to hold play up as best he can, he commits a pretty cynical foul and is duly sin-binned for his role. Massive juncture of the game coming up right now. YELLOW CARD WARATAHS! (Michael Hooper). Amazing attack from the 'Wolves who hit with speed and venom on the counter. With Matsushima splitting the defensive line, the hosts open up a three on one overlap before Himeno's effort to stretch out sees him held up by Foketi. Sunwolves still well in the contest with 20 minutes to go. There is a hive of activity on both benches. It appears a swag of changes on their way. Enormous pressure from both sides at scrum time as the 'Wolves knock on 11 metres short. With a hefty push, their front row manage to turn the 'Tahs before NSW get their revenge against the feed on the very next scrum. An infrigement then sees the Waratahs able to clear towards touch. 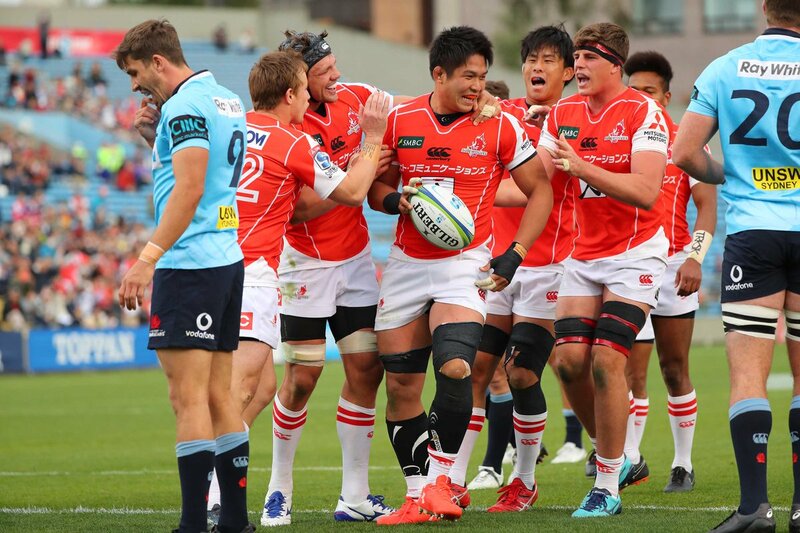 The Sunwolves are pressing but they continue to be denied by a battle ready Waratahs line up. The Sunwolves have had 56% of the possession to 44% of the Waratahs. The Waratahs are starting to look a little fatigued. 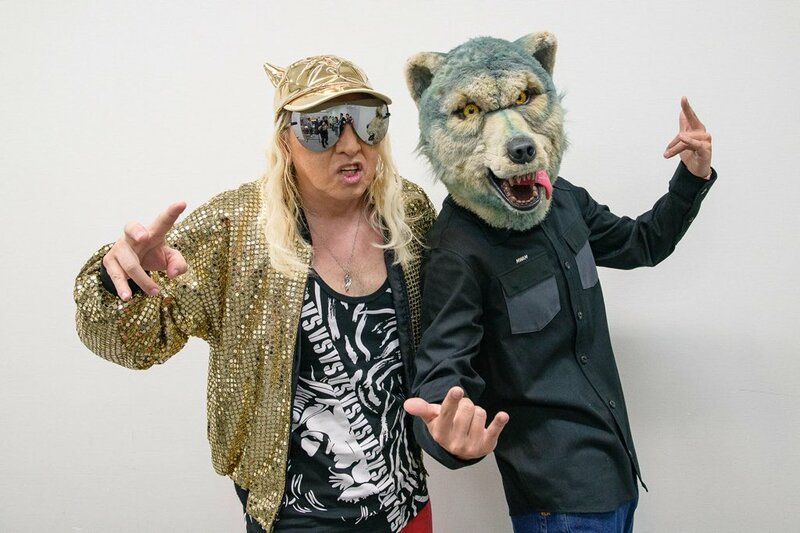 Now is the time for the Sunwolves to strike. The Sunwolves need something to spur them into action. A try can give them the run on. MISSED CONVERSION WARATAHS - Foley keeps the conversion kick low, but the ball dips under the crossbar as he fails to add the extras for the Waratahs. 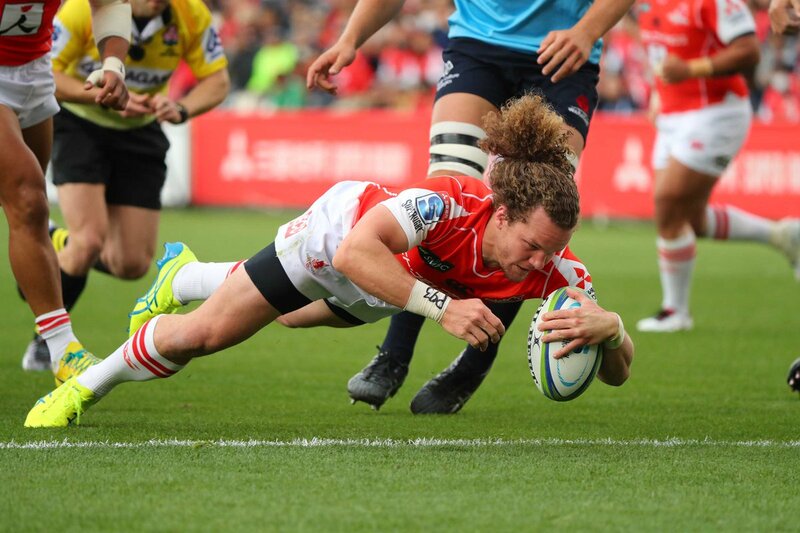 TRY WARATAHS (Michael Hooper) Sunwolves 17 Waratahs 43 - Great set piece play as Hooper dots the ball over the line for another Waratahs try. It has been a tight opening to the second half, with the Sunwolves looking for a way through the Waratahs defence. SECOND HALF - The Waratahs kick off to get us back under way for the second half. HALF TIME - The Waratahs go in to the break holding a 21 point lead over the Sunwolves, in a punishing first half performance. The Sunwolves certainly have the work to do in front of them. CONVERSION WARATAHS (Bernard Foley) Sunwolves 17 Waratahs 38 - Foley does the business and adds another two points to the Waratahs scoreline. TRY WARATAHS (Bryce Hegarty) Sunwolves 17 Waratahs 36 - A lovely ball by Beale over to Hegarty, who scores a try besides the uprights. The Waratahs are looking like they are not done yet for the first half, in terms of scoring. The Sunwolves are feeling the pressure at the moment, with every error they make, they are being punished for. CONVERSION WARATAHS (Bernard Foley) Sunwolves 17 Waratahs 31 - The ever so reliable Bernard Foley just continues to keep the scoreboard ticking over for the Waratahs, as he picks up the extra points. TRY WARATAHS (Jake Gordon) Sunwolves 17 Waratahs 29 - Gordon makes it a double today, as he gives the Waratahs some breathing space on the scoreboard, by scoring a try beside the uprights. 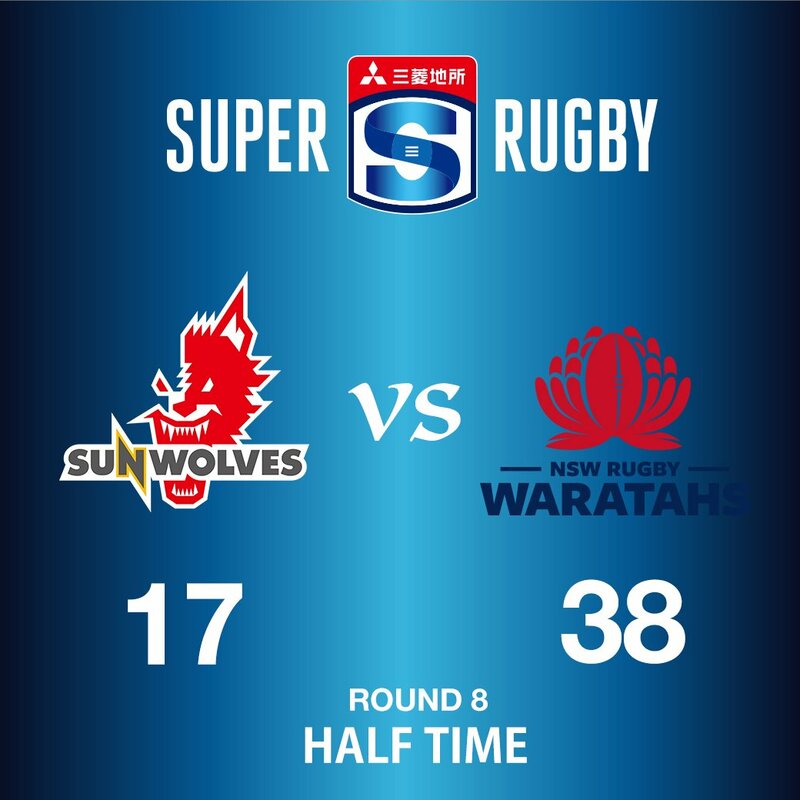 The Sunwolves appear to be falling off the pace a little with the Waratahs starting to take control of the contest. The Waratahs have had an aerial dominance over the Sunwolves, winning 20 rucks so far. Should the Sunwolves score the next try of the match, we could have a game on our hands, heading towards half time. PENALTY GOAL SUNWOLVES (Yu Tumara) Sunwolves 17 Waratahs 24 - Tamura adds another two points for the Sunwolves, who are now within striking distance of the Waratahs. 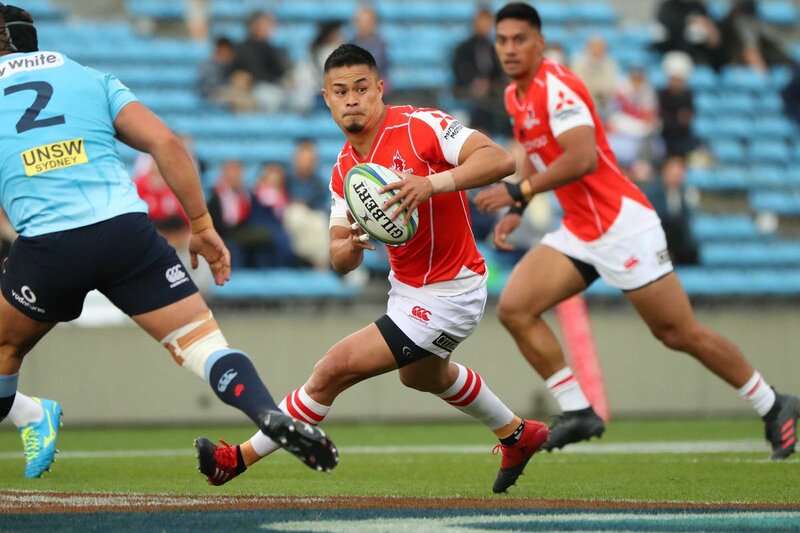 CONVERSION SUNWOLVES (Yu Tamura) Sunwolves 14 Waratahs 24 - Tamura picks up the much needed extras for the Sunwolves to bring them to within 10 points of the Waratahs. TRY SUNWOLVES (Sam Wykes) Sunwolves 12 Waratahs 24 - Champagne rugby from Little, as he runs it down the sideline, he plays it in to Wykes, who scores a try beside the uprights. The Sunwolves must score the next try here, or they risk falling further behind the Waratahs. 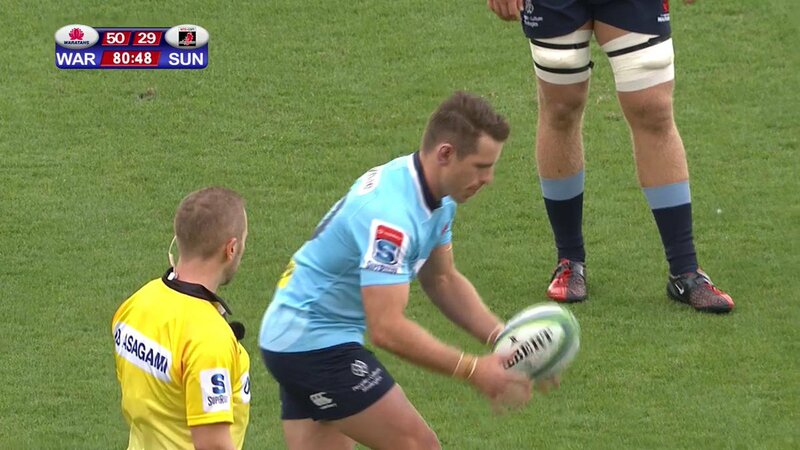 CONVERSION WARATAHS (Bernard Foley) Sunwolves 7 Waratahs 24 -Foley keeps his perfect kicking record alive as he picks up the extra two points for the Tahs. TRY WARATAHS (Will Miller) Sunwolves 7 Waratahs 22 - Fantastic play by Fitzpatrick as he dishes off to Miller, scoring another try for the Waratahs. CONVERSION WARATAHS (Bernard Foley) Sunwolves 7 Waratahs 17 - Foley makes no mistake as he threads the eye of the needle. TRY WARATAHS (Curtis Rona) Sunwolves 7 Waratahs 15 - Foley once again has a part in a scoring play, with a flick over to Rona, scoring a try beside the uprights. 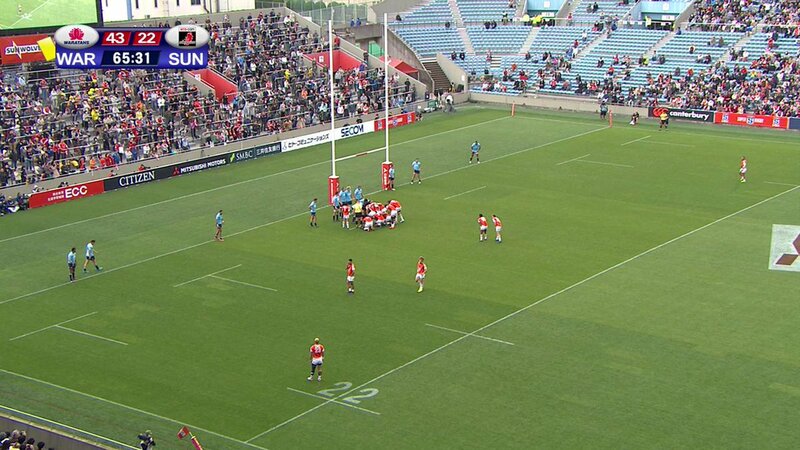 PENALTY GOAL WARATAHS (Bernard Foley) Sunwolves 7 Waratahs 10 - Foley takes the penalty kick after a high tackle. He kicks it straight through the uprights. CONVERSION SUNWOLVES (Yu Tamura) Sunwolves 7 Waratahs 7 - Tamura with a pinpoint kick to tie up the scores for the Sunwolves. TRY SUNWOLVES (Michael Little) Sunwolves 5 Waratahs 7 - Little with a stunning solo try, keeps the Sunwolves within striking distance of the Waratahs. 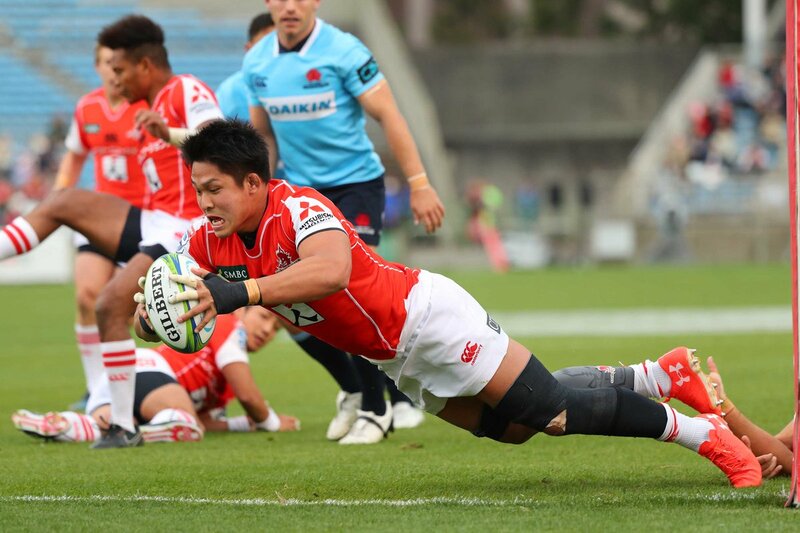 The Sunwolves continue to pile on the pressure on the Waratahs. Surely their time to score will come soon! CONVERSION WARATAHS (Bernard Foley) Sunwolves 0 Waratahs 7 - Foley has no problems with the kick and he picks up the extra points for the 'Tahs. TRY WARATAHS (Jake Gordon) Sunwolves 0 Waratahs 5 - Gordon takes the quick pass from Foley and he dots the ball in the corner to score the first try of the match. The speed that the Sunwolves are trying to play this game, is really catching the Waratahs off guard. It has been an even opening to the match with both teams giving as good as they get. FIRST HALF - The Sunwolves kick off and we are under way. The Waratahs will go in to this one as the favourites, with a win today, putting pressure on the Rebels who are on top of the ladder in the Australian division. 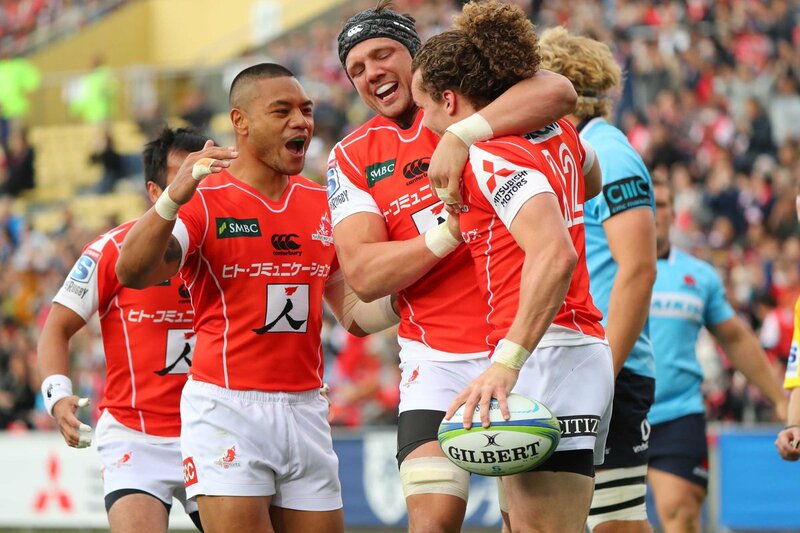 The Sunwolves have not been able to register a victory for this season and will have a large mountain to climb if they want to upset the Waratahs. Welcome to Prince Chichibu Memorial Stadium for the match between the Sunwolves and the Waratahs. RT @Bristol_RFC: Massive credit to @ealingtfrugby. @JacobFJ Apologies, but it's a delayed stream. It will be up on the website after the game. @ChiefsRugby pick up their fifth consecutive win with a 21-19 victory over @BluesRugbyTeam! 72" | Bernard's kick brings the NSW Waratahs to a half-century as the ball bounces off the cross bar and over! 71" | TRY!! @TaqeleN crashes over in the corner, shaking off two defenders on his way! 57" | Sunwolves turn the ball over in the scrum, and we will pack down for another!